I have bought my beloved Bernina Aurora 440 QE in December 2009. I thought to myself that the best way to learn to know my new ‘friend’ was to join the Bernina club at the local sewing centre close to home. 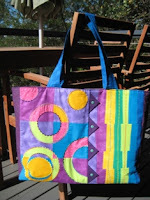 A year-long project for 2010 is to make up panels and put them together as a craft bag. Kits were made up for each lesson and everyone in the class learnt to use different techniques and sewing feet to sew up panels with their own 'finishing touch'. It has been almost a year since then. I missed three lessons due to my work commitments but did have the kits to work on in the early hours of the day when it’s quiet and cold.!! 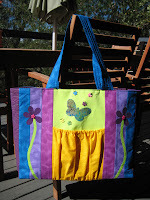 This weekend, I have finally caught up with the project and put together all the panels to make up a bag. The bag turns out to be quite large, so I call it ‘Monster’ bag. The colours and designs aren’t my style. But as part of the learning process, I’m prepared to accept what comes. I took it to the Tatters’ Guild get together yesterday and the ladies loved it. 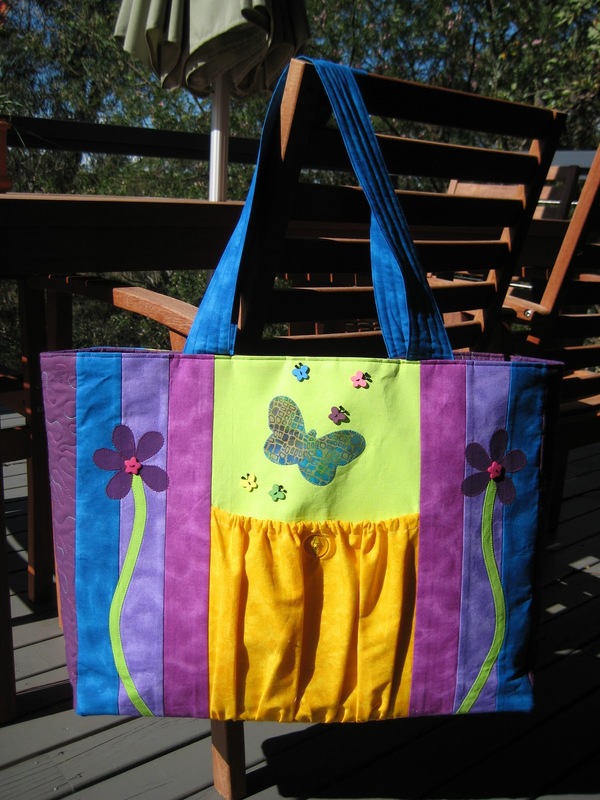 They all thought that the bag was great and ‘arty’. I will have to make a point of using it now and then when I feel like being a bit ‘different’ from my usual creative self, especially when I go to sewing lessons.!! Wow, great bag! I love it! 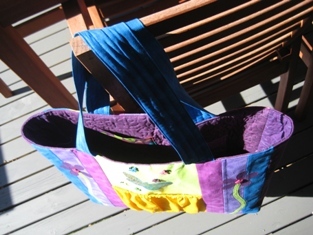 I'm warming up to the bag, Linda, and having been using it to go to all my sewing lessons, so far.